This policy has been prepared to support teachers in the effective planning, teaching, and learning, assessment and evaluation of English ensuring a whole school approach. At Karama School teachers are expected to run an hour long reading lesson 5 days a week. These lessons must be in a small group setting, explicit in their lesson focus and supportive with differentiated tasks and strategies. 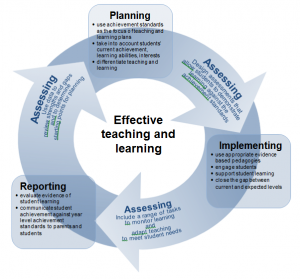 The Big 6 – Literacy Literature Review for Evidence-Based Practices Framework. Reading to children is a valuable activity that should occur daily at all year levels. Students of all ages benefit from having books read to them in a supportive environment. It enables teachers to model fluent oral reading and introduce new vocabulary and genres. Teachers can also present quality literature that most students would find difficult to read independently. It exposes students to wide range of text types, writing styles and authors. Teachers read all sorts of books both fiction and non-fiction to students to promote reading. Modelled reading focus is on the explicit planning and demonstration of selected reading behaviours. This regularly included the demonstration of comprehension and word identification strategies. Students participate by actively listening and watching rather than contributing, suggesting and pursuing discussions. When using modelled reading it is important to choose a text that is most suited to demonstrate the selected reading behavior. Think Alouds are used to model the thought processes that take place when difficult material is read. When using think alouds, teachers verbalize their thoughts while they are reading orally. Students will understand comprehension strategies better because they can see how the mind can respond to thinking through trouble spots and constructing meaning from text. Shared reading can be used with small groups or a whole class group. Shared reading involves a teacher and students reading and rereading from a large print text, or an interactive text, in a positive, supportive and interactive environment. In shared reading sessions the teacher and children sit together around a big book or an interactive whiteboard, so that all can see the print and the illustrations. The teacher or a child points to the print and the children join in, reading at their own level of expertise. It enables the teacher to focus on discussions and demonstrations of strategies that can be used to make meaning from print. It also enables teachers to demonstrate the use and integration of semantic and syntactic cues to work out unfamiliar words and the use of graphophonic cues to confirm or change predictions made. Guided reading is a procedure that enables teachers to observe a small group of children (no more than eight) as they develop understanding of reading processes and practice their literacy skills. The group reads books assigned by the teacher. The teacher facilitates discussion and guides, or directs the readers. Groups are sometimes, but not always, ability groups. They are formed according to children’s needs and the purpose of the session. Reciprocal Teaching is a strategy that asks students and teachers to share the role of teacher by allowing both to lead the discussion about a given reading. 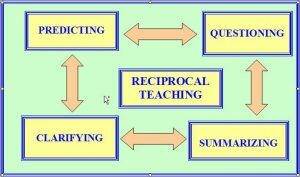 Reciprocal Teaching involves four strategies that guide the discussion: predicting, question generating, summarizing and clarifying. Reciprocal Teaching is a great way to teach students how to determine important ideas from a reading while discussing vocabulary, developing ideas and questions and summarising information. It can be used across several content areas; it works particularly well with textbooks and non-fiction text. Children learn to read by reading and by seeing others read. The ultimate aim of any reading program must be to produce independent readers. All children, therefore, even the very young, need to be given daily opportunities to read independently. By allocating time for children’s independent reading, teachers are able to reinforce the idea that reading is a valued and worthwhile pastime and to encourage children to engage in real reading. Daily home reading is an integral part of Karama School’s reading approach and is implemented throughout all years of schooling. The aim is for all students to improve their reading skills and become independent readers who are able to select their own material from a variety of sources and range of formats. It allows students to practise reading strategies taught in classroom reading sessions, it develops sound reading habits and fosters a true appreciation for reading. 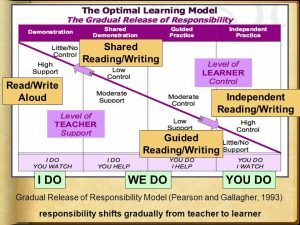 The Gradual Release of Responsibility is a research-based instructional model developed by Pearson and Gallagher (1993). In this optimal learning model, the responsibility for task completion shifts gradually over time from the teacher to the student. · What makes an effective, independent reading task? 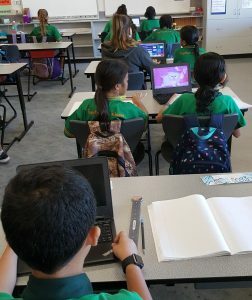 · What do students do when they finish? · Consider M.S.V – which support are you after? What do you think the text will be about? What pictures are you seeing in your mind? Which words might help you? What questions might the text answer? – What words phrases or ideas do you not understand? To be investigated in 2018. Currently at Karama School we encourage teachers to utilise both the First Steps Writing resource and the Sheena Cameron and Louise Dempsey, The Writing Book to scaffold the teaching and learning of writing. Teachers are expected to refer to the Curriculum Map when referring to writing genres taught within the year level. At Karama School spelling is conducted via the Soundwaves Spelling Program. This program is implemented in Year 2. We encourage parts of the program to be used earlier so all children are familiar with the resources. The SoundWaves phonemic approach uses a sound-to-letter strategy which acknowledges that sounds can be represented more than one way in written form. This synthetic phonics approach focuses first on the basic units of sound in our language – phonemes. It then explores the letters that represent these sounds and how they can be put together to form written words. At Karama School teachers are expected to run a half hour long spelling lesson 4 days a week. These lessons must be small group, explicit in their nature with differentiated learning as their focus. At Karama School teachers are expected to embed effective Oral Language practise across all curriculum areas. Karama Schools whole school approach to oral language is derived from the practical, evidence based resource of Sheena Cameron and Louise Dempsey utilising ‘The Oral Language Book, Embedding talk across the curriculum.’ Each classroom teacher is assigned this resource and it is expected to be utilised and evident in teacher planning documents. Teacher Public – Oral Language – Oral Language Rubric. Teachers will select the rubric that is appropriate to their year level taught. As a core resource for teaching Oral Language in Early Childhood, the PLD Program is expected to be planned for and assessed for classes within the T- 2 year level. Literacy involves more than just recognising words on a page. To be truly literate – and to have the capability of excelling in every part of life – students must be able to speak well, interpret what they’re hearing and transfer all of this to the written language. It’s this three pronged focus that sets PLD Learning Resources apart. Importantly, it’s a strategic approach guaranteeing the best results for the children in your care. Only when skills in all three skill set areas have been sufficiently acquired, will a student’s literacy-learning based outcomes be maximised. PLD’s range of products and services represent a unique and distinctive integration of recent research findings and best practice in the disciplines of speech pathology, occupational therapy and education. Running Records based on classroom texts and assess students working levels of reading. They are conducted one on one and inform teachers of reading habits, fluency, accuracy and comprehension of the text. Soundwaves has a range of assessments that can be flexible in implementation by the classroom teacher. They include weekly pre and post-tests, readiness tests and end of year assessments. Soundwaves assessments are used regularly to gauge students’ progress of phoneme and grapheme use in spelling and writing. PM Benchmark Resources have been designed to explicitly assess students’ instructional and independent reading levels using unseen, meaningful texts. They provide accurately levelled fiction and non-fiction texts ranging progressively from emergent levels to reading age 12. Probe is used to provide an assessment for older students that gives the in-depth data of a running record. It assesses reading accuracy, reading behaviour and reading comprehension. It may also be used as a measure of silent reading comprehension and listening comprehension. PAT Reading is a thoroughly researched and normed test for measuring and tracking student achievement in reading comprehension, word knowledge and spelling. It provides teachers with objective information for setting realistic learning goals and planning effective programs. PAT Spelling is designed to assess students’ understanding of the standard Australian English language conventions of grammar and punctuation, it comprises two components: Written spelling (Years 2 – 10) and Grammar and Punctuation (Years 3 – 10). PAT-SPG has been developed especially, but not exclusively, for use in Australian schools. It provides teachers with objective information about students’ spelling, punctuation and grammar skills so that realistic learning goals can be set and effectiveness of teaching strategies can be monitored. PLD – Pre Literacy Screening investigates students’ development in phonological awareness and alphabetical knowledge, core skills which predict early literacy achievement. FELA – The Foundations of Early Literacy Assessment territory is an assessment tool designed to identify and monitor student mastery of the alphabetic code in English. 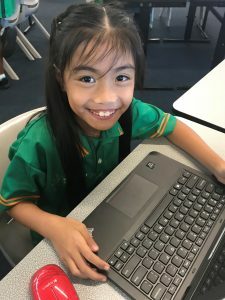 The Smarter Schools National Partnership on Literacy and Numeracy is a joint initiative of the Australian Government and the Department of Education and Training Northern Territory Government. Iaquinta, A. (2006). Guided Reading: A Researched-Based Response to the Challenges of Early Reading Instruction. Early Childhood Education Journal, 33. .